At 10:30 we went to Cafe 41 in Eastwood Road for our monthly Literary Coffee Klatsch of Neoinklings, and David Levey joined us to inkle, as he put it. It seemed a rather felicitous term. He told us of a thesis someone had written, or was writing, on Tolkien’s South African connections, and we had a rather discursive discussion about that — Tolkien had left South Africa when he was 3 or 4, and as far as I know he never returned. Most of one’s memories of that age seem to be a series of still pictures. I recalled Leo Aylen, a poet who was the son of a former Anglican bishop of Zululand, who visited there about 35 years ago. He said the Australian aborigines had a concept of early childhood as one’s dream time, and he was revisiting the scenes of his dream time to give him something to write about. We talked of the landscape — the Free State, where Tolkien was born, seems to be like the land of the Rohirrim in Lord of the Rings, and Val said that Goanikontes, in the Namib desert, was like Mordor though it seems unlikely that Tolkien would have visited it. Goanikontes had been where Val’s great great great grandparents, Frank and Frances Stewardson, had lived for a while, in the 1850s, and it may have been there that Frank Stewardson had been mauled by a lion. We talked about the identity, or lack of it, of white English-speaking South Africans. It will be interesting to see if the thesis mentions whether Tolkien had such an identity, but generally speaking white English-speaking South Africans do not have a distinctive identity or a distinct culture. There is no consciousness of being a “volk”, like the Afrikaners. Though one could put them in a Venn diagram, it would be far less significant than a set of white Afrikaans -speaking South Africans, or Zulu or Tswana-speaking South Africans. I mentioned a friend who had recently written of “we”, referring to white South Africans, and that I find that to be one of the primary markers of racism, using “we” to refer to a group defined by race, and “they” or “these people” to refer to the outgroup. David said that John Lambert, one of the former history lecturers at Unisa, was writing about white English-speaking South Africans, and it will be interesting to see what he comes up with. He also mentioned that the history department at Unisa has now been reduced to one lecturer, which is very sad, and does not augur well for the future of South Africa — all of history before 1994 will, in effect, become dream time, and labelled “Van Riebeeck”. It took me a while to read this book, even though it is quite a short one, and all the action takes place in a single day. I suppose ideally one should read it in one day too. It is a day in the life of Clarissa Dalloway, a London housewife who is preparing for a party. The story switches from one viewpoint to another, not only her own, but those of people around her: servants, an old friend, her daughter, a suicidal shell-shocked soldier and others. It is set in the 1920s, and so scenes from Downton Abbey come to mind. One of the reasons it took me so long is that I got distracted into reading other books in between, one of which was The Greater Trumps by Charles Williams. I began re-reading it as a result of a discussion about the names of books by Benjamin Disraeli, the titles of whose books Sybil, Lothair and Coningsby were used for the names of characters in The Greater Trumps. I could not help but be struck by the contrast between Mrs Dalloway and The Greater Trumps. Both are set in a similar period, between the World Wars of the first half of the 20th century. But in Mrs Dalloway I was much more conscious of the setting in a specific time and place — London of the 1920s. I lived in London for a few months in the 1960s, but the London of 40-45 years earlier was very different, just as it is very different today from the 1960s. Some things may have been the same — the sea of bowler-hatted businessmen crossing London Bridge each morning and afternoon may well have been similar in the 1920s and 1960s, but now they belong to a vanished past. But in Westminster, where Mrs Dalloway is set, the fashions were very different in the 1960s, and are probably different from both today. In The Greater Trumps, by contrast, though the action moves from a London suburb to the country, the time and place are less important. One could film it today, in present-day clothes, and it would make little difference to the characters or plot. The setting is important, in the sense that it is an isolated country house, and there is a snow stom, but characters and plot take precedence over time and specific place. So this is not really a review of Mrs Dalloway, but the Good Reads review prompt asks “What did you think?” and that’s what I thought. Every year, between Christmas and New Year (New Year’s, if you’re American) butterflies migrate through our garden, flying northeast. They occasionally land briefly on flowers and other plants, perhaps for a bit of refreshment, but they are soon on their way. Every year we see them going, always in the last week of the year, but we never see them coming back. Where do they come from, and where do they go to? There is a story by Charles Williams, The place of the lion , which has a scene that these butterflies remind me of. In William’s book the Platonic archetypes begin to gather their antitypes into themselves. The world becomes aware of this when a lioness escapes from a circus to find and be drawn into the archetypal lion. Then a butterfly collector notices a migration of butterflies, and follows them to see where they are going, and sees the mother and father of all butterflies, drawing all its children to itself. And so this one-way migration reminds me of this story, one that I have read several times. At this time of the year I am also reminded of another book by Charles Williams, War in heaven . That is because at Matins on Christmas Eve we sing the Polyeleon, the “many mercies”. Sihon, King of the Amorites: for his mercy endureth forever. And Og the King of Bashan: for his mercy endureth forever. And whenever we sing it, it gives me goosebumps. And still I wonder where the butterflies go to every year, and why they never return. One of the things that I find vaguely annoying is the kind of nonsense one often hears spoken about Tarot cards. On the one hand you hear some Christians saying that Tarot cards are of the devil, and on the other you hear occultists talking about their deep hidden meaning that only those really in the know can discern (and when those in the know do reveal, in conspiratorial whispers, what they have discerned, it usually turns out to be quite trivial). Tarot’s new fortunetelling function was quickly seized upon by 19th-century fans of occultism, which was what bored white people used to do in the 19th century before backpacking around India was invented. The occultists ‘discovered’ tarot’s long history and renamed the two parts of the deck ‘Arcana’ to replace the slightly less spooky trumps and pits. I first heard of Tarot cards in Iris Murdoch’s novel The sandcastle in which a schoolgirl used the cards to interpret things that were going on in her life. The descriptions meant nothing to me, so I went out and bought a pack of Tarot cards. The only place in Johannesburg that sold them, I discovered, in the Johannesburg of 1962, was “The Mystic Bookshop”, which was on the second floor of a rather seedy looking building in Eloff Street (which probably looks a lot seedier today). The shop was full of spooky paraphernalia, like crystal balls, candlesticks in the shape of snakes and other such things. They had only two packs of Tarot cards in stock, retrieved from a dusty shelf in a rarely-opened cupboard, so I gathered that there wasn’t a big demand for them. I took the cards home, and looking at them discovered what references to The Hanged Man and the Falling Tower in the book actually meant. I was also struck by the Christian imagery of the cards, especially in the Greater Trumps. The people were all dressed in medieval clothes, and one felt transported back into an age of faith, in which Christian imagery and symbolism came naturally to people and were a part of everyday life. In The sandcastle the girl, Rain, assigns the cards her own meanings, and relates them to the people and events in her life. I became quite curious about them, and mentioned this to Brother Roger, an Anglican monk of the Community of the Resurrection, who had lent me the Iris Murdoch book. His response was to lend me another book, The Greater Trumps by Charles Williams. Central to the Williams book is the role and character of The Fool, shown on the left. Williams’s dealing with the Tarot in his novel is quite different from that of Iris Murdoch, though there is one common feature. Like Rain, Williams interprets the cards in his own way; he takes some of the occultists’ interpretations, but reworks them and weaves them in with others, and in a sense restores the Christian symbolism that the occultists removed. The Cracked article debunks some of the 19th-century occult hogwash about the cards, and points out that they were, like ordinary playing cards, originally intended to be used in a game. But the designers and manufacturers of the cards incorporated symbolism of the world around them. There are French packs that are clearly influenced by the Renaissance and the Enlightenment, but the oldest ones seem to have been designed in a Medieval setting, real or imagined. Charles Williams had some associations with occultists, including A.E. Waite, who was one of the originators of the Rider-Waite pack referred to in the Cracked article. I was rather saddened to discover that that was the pack that Williams was probably most familiar with, in which the Fool has been debased into the image of a late-Victorian fop. But the main point remains: Tarot cards have whatever symbolism we want to give them. As a Christian, I suppose I prefer the older Marseilles pack, with its Christian symbolism, into which, like Rain in the novel, I can read whatever symbolism I wish. I find the Rider-Waite pack rather repulsive, and I can’t think of them as “real” Tarot cards. 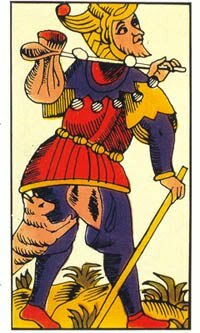 I suppose one of the things that appeals to me about the “real” Tarot cards is that in the figure of the Fool there are echoes of the figure of the “fool for Christ”, a kind of saint who was more common in medieval times than in more recent ones. 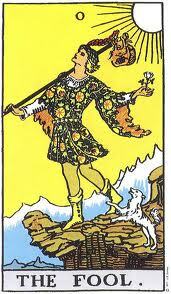 And that is one of the reasons I have adopted the Tarot Fool as my “Gravatar” for blog comments and the like. Not that I am a real fool for Christ, but rather a wannabe. The Rider-Waite version doesn’t cut it. Yet when I did a Google image search for the Fool of the Tarot, the real Fool didn’t come up at all on the first three pages. And perhaps that is because in our age, the real Fool is hidden. Howbeit we speak wisdom among them that are perfect: yet not the wisdom of this world, nor of the princes of this world, that come to nought: But we speak the wisdom of God in a mystery, even the hidden wisdom, which God ordained before the world unto our glory: Which none of the princes of this world knew: for had they known it, they would not have crucified the Lord of glory (I Cor 2:6-8). And “occult”, of course, means “hidden”. And this came up in another context earlier this week. There was a synchroblog on the Wild Goose Festival, a kind of vaguely Christian wayzgoose held in the USA last month. We were told that the wild goose was an ancient Celtic Christian metaphor for the Holy Spirit. I couldn’t attend the festival, and had never heard of the ancient Celtic metaphor, so I decided to write about it once I had found out more about it. I found it stretched back over the years to the dim and misty 1960s, which makes me feel really ancient. And I think that makes an eighth that could be added to the Cracked seven. From Auden’s testimony “witnessing” can be more effective if it is a mode of being than a mode of soing or talking.